Cocaparra National Park was described by the explorer Oxley as a place not worth visiting, but we found it to be very enjoyable. Red dirt roads into the park, so first we had to ring the NPWS to make sure we could get out if it rained (it did and we could), so we could now relax. 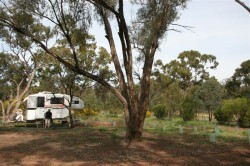 On our own for the first night with the absolute silence that only the Aussie bush can deliver. 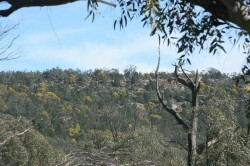 The view from the camp to the hill opposite was great in the morning as the early sun, well relatively early, highlighted the wattle flowers and the rock escarpment. 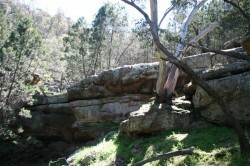 We enjoyed a walk to Woolshed Falls but, unlike the other falls we have visited on this trip, this one had only a trickle over the top. 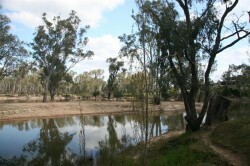 After a couple of days we moved on to Corowa and found a great camp site overlooking the Murray. While we were traveling to Corowa, we booked a picnic hamper from the Pickled Sisters in Wahgunyah. We have enjoyed their hampers a number of times on other visits. We were not disappointed. We collected our hamper and went back to our camp to enjoy a great hamper while overlooking the Murray, all washed down with a delicious Bullers Sparkling Pinot Chardonnay. Cloth tablecloth and serviettes, china plates, metal knives and forks all supplied with the food. The best part is that there was so much food we were able to save enough for lunch tomorrow. The only down side is that we have to go out again to buy some wine to have with it! We see it as our contribution to helping the regional economy! I suppose someone has to do it. We will be off to Milewa on Monday for more gormandising and then home.